So my team didn’t win!!!! Shoot! 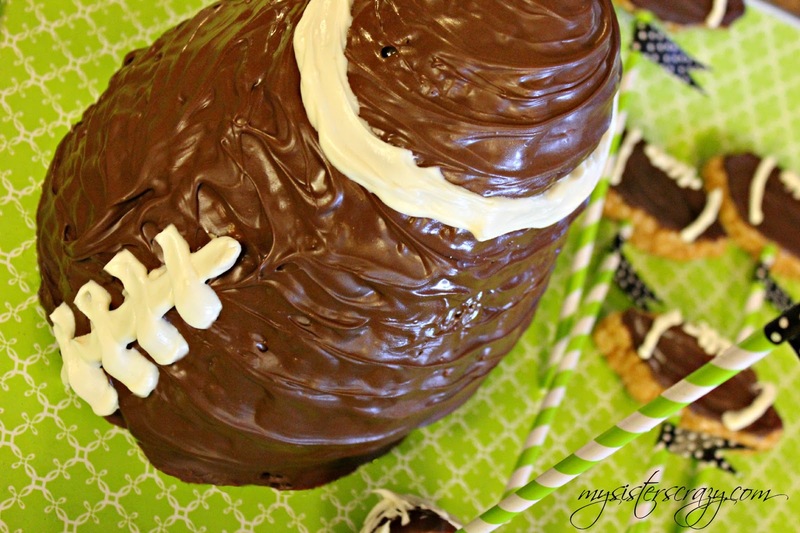 It really doesn’t matter…the Super Bowl is ALL about the party for me! 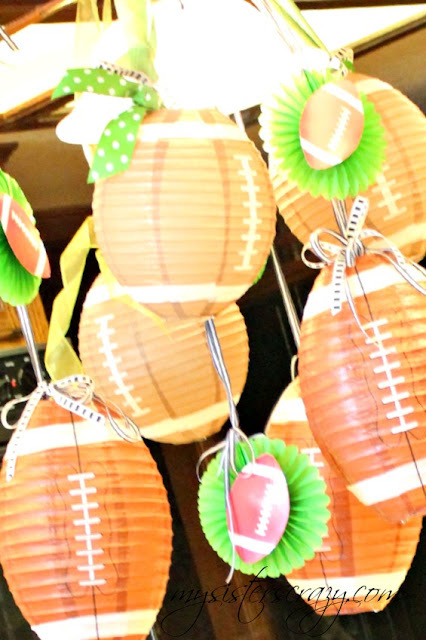 The party may be different every year but, a Super Bowl party is a tradition we have come to rely on. 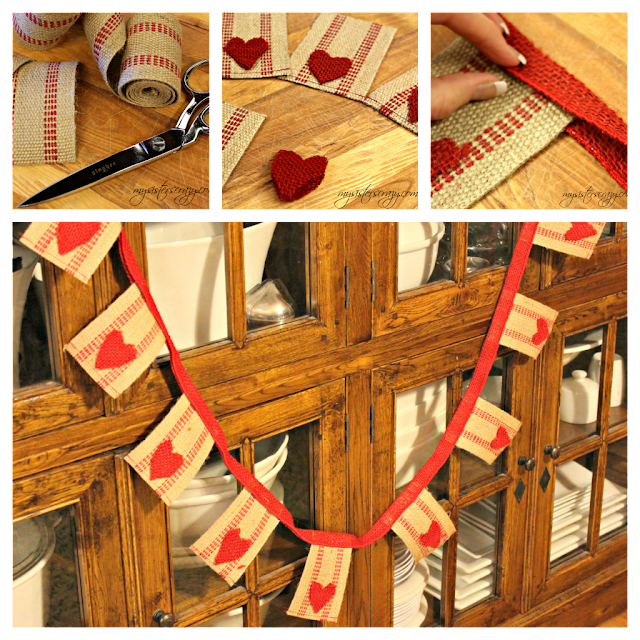 This years party began with simple decorations ...for me there always has to be some "nod" to a party atmosphere. I didn't decorate for a specific team. I usually don't care enough who is playing to really dedicate time or money into specific "team" decorations. I stick to the basics. Brown footballs, green grass, and the black and white stripe of the umpires shirt are an inspiring combination and it is all the theme I need! I also did it cheap and easy!!!!! I always get big bang for my buck using football lanterns. They go up easy, and store flat. I think it's fantastic that something with this much volume can be stored so easily! 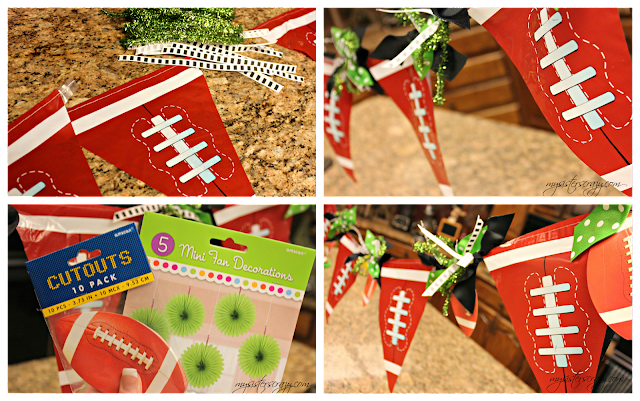 I used a plastic football banner from the dollar store. It was actually pretty long. I cut it in half. To spice up the dollar banner I tied the string that held the pendents with ribbon and hung an extra football cutout in the middle of the pendents. Party City has packages of 10 paper footballs for a buck...Thank you Party City. I couldn't make them that cheap. Their paper fans are also surprisingly cheaper than making them. When I don't want to use a specific paper...I go cheap. I added more of the footballs that I used in the banner for center of them of the tissue fans. The tissue paper fans are $1.99 for 5. Good deal! While I was at the party store I saw the funniest hat, had to buy it. I wasn't sure what I was going to do with it, I just had to have it. 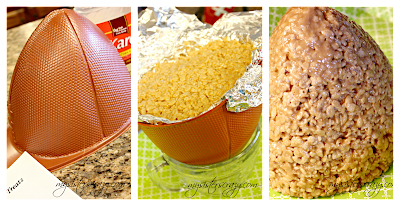 I got a genius idea it would make a good mold for a peanut butter rice krispie football. I think it is so funny, too funny in fact. Looking back it may have been a mistake but, whats done is done! You can shape this stuff into any shape you wanted...that could get scary! I had plenty of leftover warm rice krispie goo that I made several other treats. My family loves to eat these. I have to admit I was sad to see the goofy giant football get cut into pieces. It was so cute on the table...why did they have to eat it?!? Oh!!! That is right...that was why I made it. 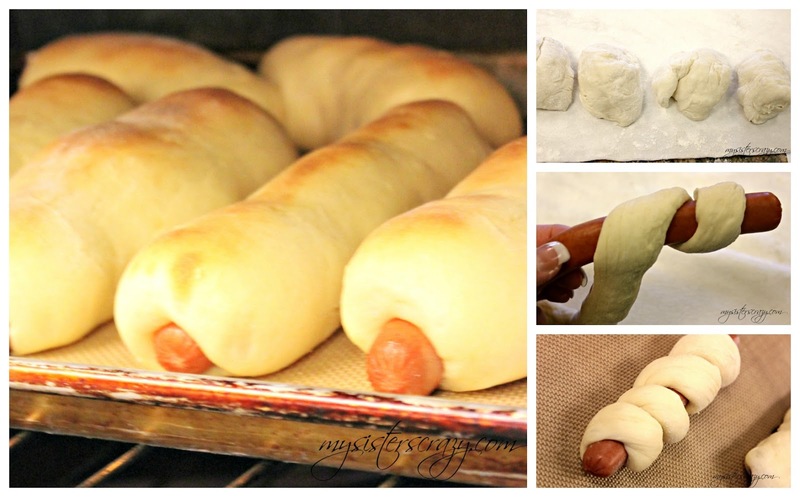 Another family favorite is a homemade hot dog. No, I'm not at home stuffing ground meat parts into casings. I'm referring to the homemade bun. The entire family loves these. I REALLY don't like a hot dog. However, these don't really qualify as a hot dot. With these, it is all about the bun! What's not to like about that!?! In honor of the hosting city of New Orleans, I decided to throw a little Cajun flavor in. This is a Cajun Mustard Sauce. I was a little skeptical at first...not any more. I am seriously thinking about always keeping a mixture of this in the fridge. It is killer on the dogs and would make a great spread for sandwiches. The great flavors of New Orleans continued in several other classic dishes. Beignets, are always loved and don't stay around long. When we are in Scottsdale we like to eat at restaurant that serves beignets. 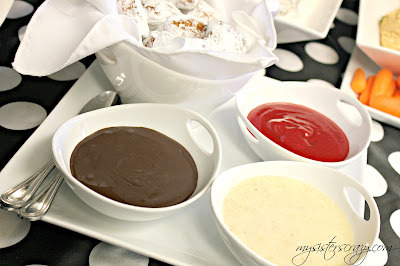 Their beignets always come with 3 dipping sauces: Chocolate, raspberry, and a lovely cream sauce. 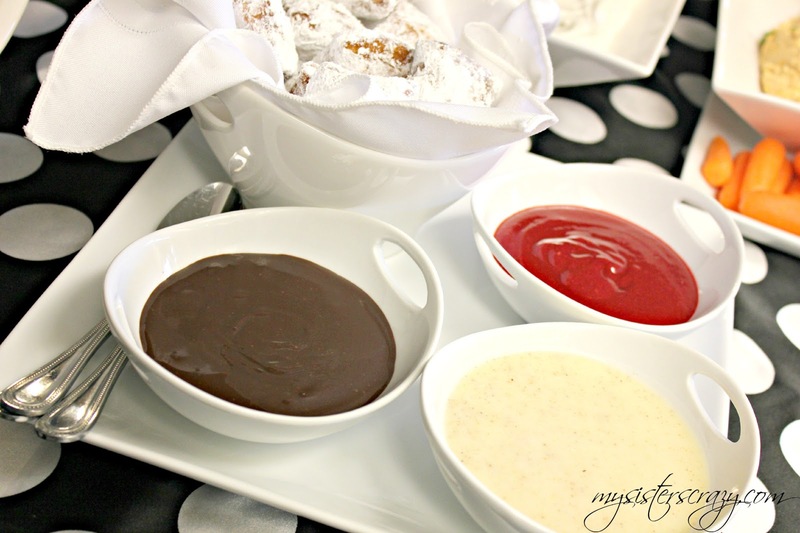 We decided to recreate these fantastic sauces. SOOO GOOD! 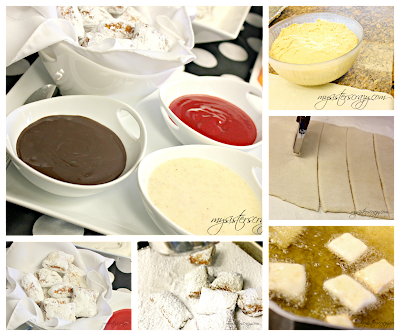 This beignet recipe is one that my mom uses. It is made the night before and put it in the fridge overnight. 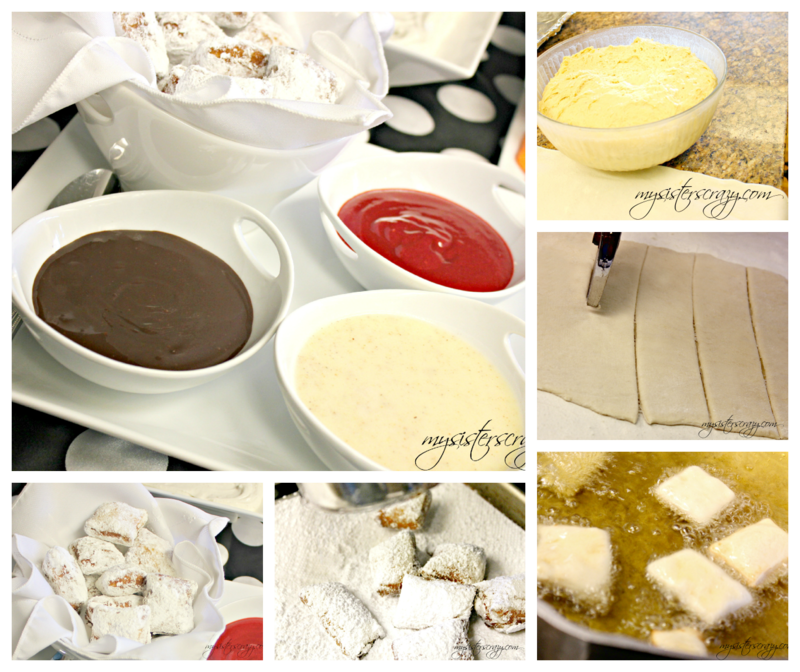 The next day you roll it out, fry it up, and sprinkle them with powdered sugar. I can't think about eating these without the sauces. There are only a couple of people in my family who don't like shrimp. I feel bad for them when we serve this dish. Nawlin's Shrimp. It has all the fantastic flavors of New Orleans. The shrimp are perfectly cooked and they are delicious. 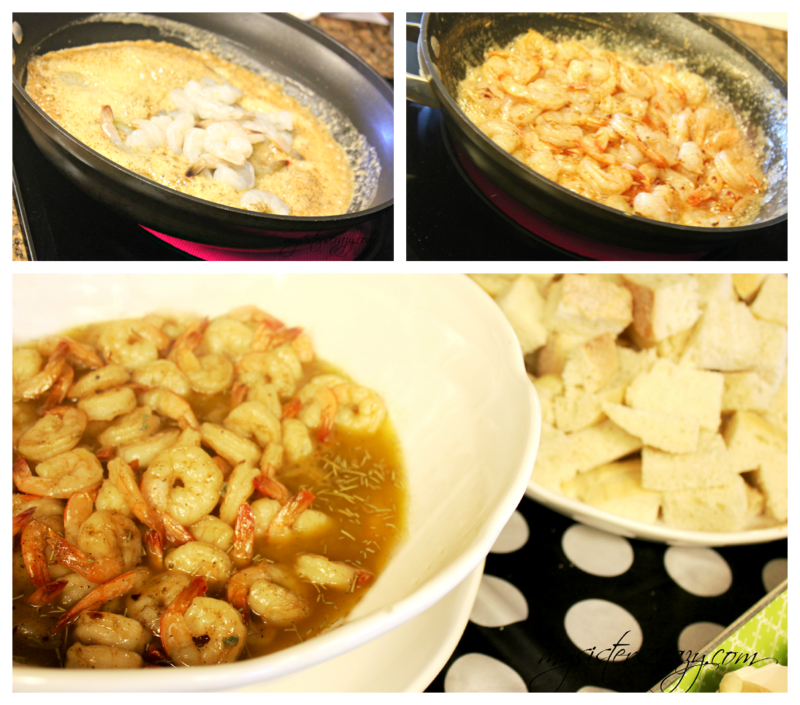 However, the BEST part it the sauce that the shrimp are cooked in. HOLY COW, so good. I have a crazy sister who HATES, HATES, HATES, shrimp but, would drink a bowl of the sauce. The secret to the sauce is the unique blend of spices and of course, butter. We serve cubes of bread by the side of the shrimp bowl. 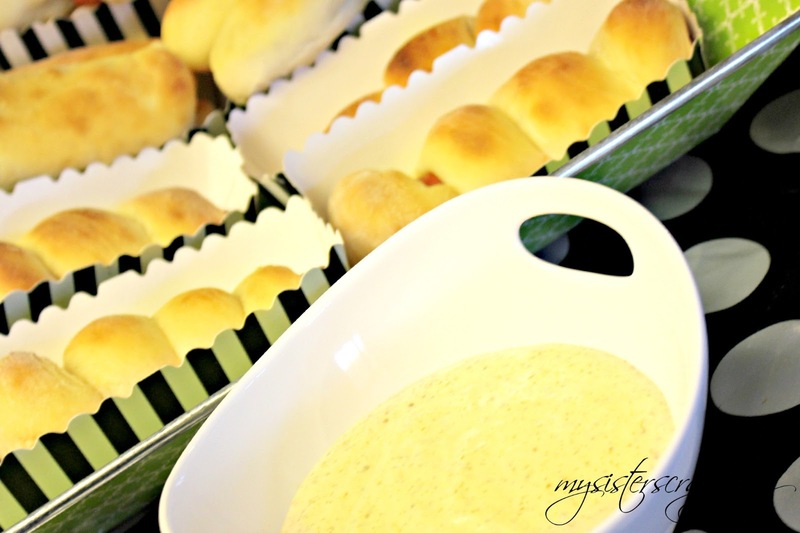 There is nothing better than fresh bread dipped in this sauce. Getting the spices together is the longest part to this dish. Once they are ready, this dish is ready in under 5 minutes. What is football without Hot Wings? They just seem to go hand in hand. 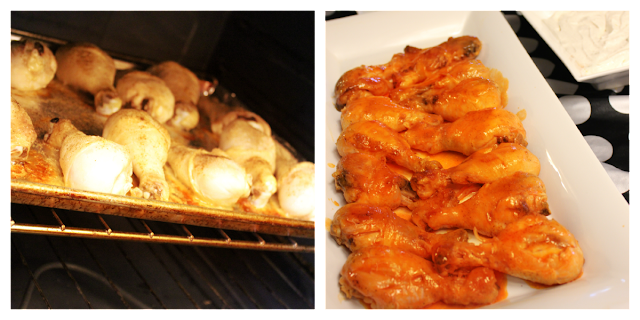 We have way too many people to serve dinky little chicken wings. 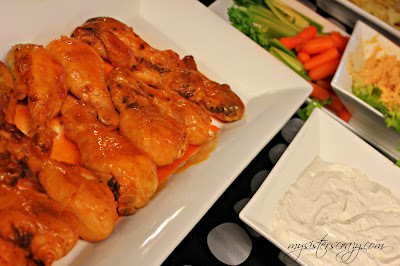 So, we serve Buffalo Drum Sticks. These spicy meat sticks hardly touch the serving platter before they are gone. They are served next to a fresh bowl of homemade ranch dressing. Not the kind from the package...the real homemade kind! YUMMM!! 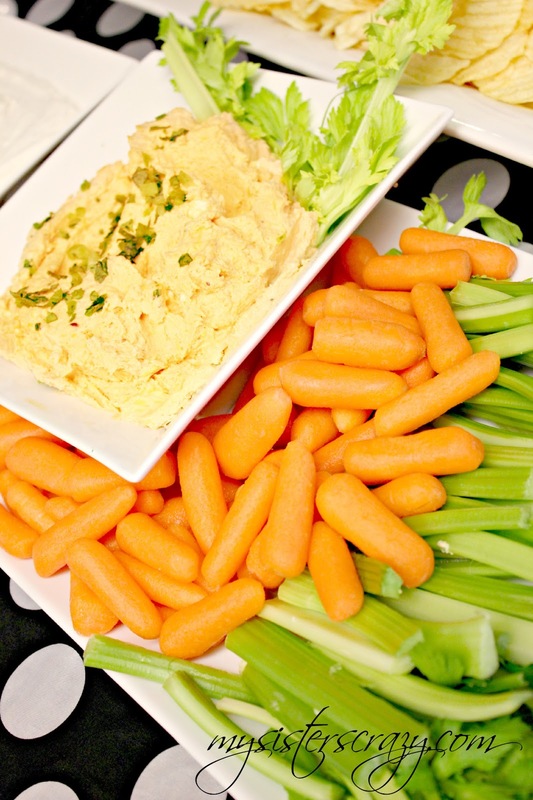 Just when you think that there is a gross amount of food on the menu...we add the dips, chips, and veggies! These are three of my personal favorite party dips. Really anyone of these dips stand alone but, together they are a force to be reckon with! 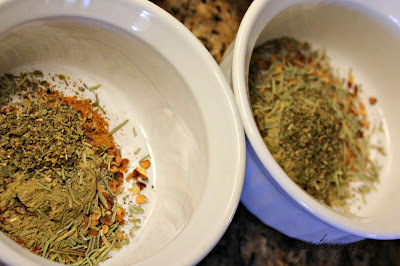 The first is a Spicy Buffalo Chicken Dip. It is D-lish on crackers, bread, and celery. (The Celery is my favorite!) It has chicken, Franks Sauce, cheeses, and a killer ranch flavor. This would actually make a fantastic Hot Wing Cheese Ball. Wouldn't that spicy up the cheese ball world!?! 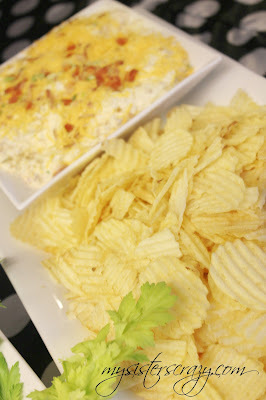 The second, is a dip that makes a baked potato super jealous! All baked potatoes everywhere are begging to be covered in this dip. On game day, the potato of choice is in the form of a chip. This dip has all classic flavors of a fully loaded baked potato. My oldest and most sarcastic son lovingly refers to this dip as "All That AND A Bag Of Chips" or "Tater Chip Dip". Call it what you will...we love this on any form of potato! 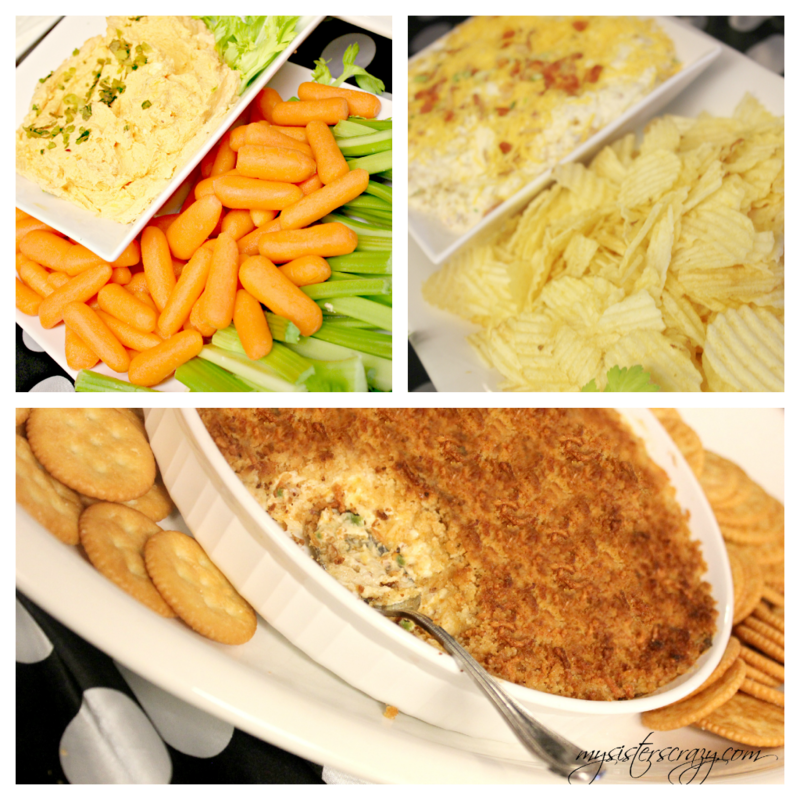 Last but, certainly not least...The Jalapeno Popper dip. I have to admit that although I am a giant baby when it comes to spicy stuff, I love the taste of the popper. I just hate taking the time to prepare them. This dip wraps all that bacon, jalapeno, and cheese into one quick dip. 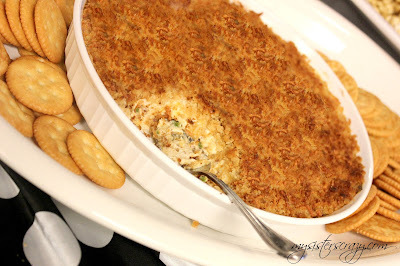 I hate to pick a winner...but this Popper Dip might just be it! 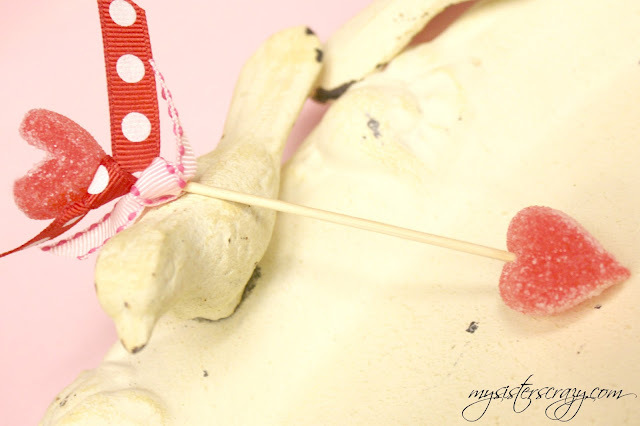 There is one flavor I love at Valentine’s Day, spicy little Red Hot Candy. 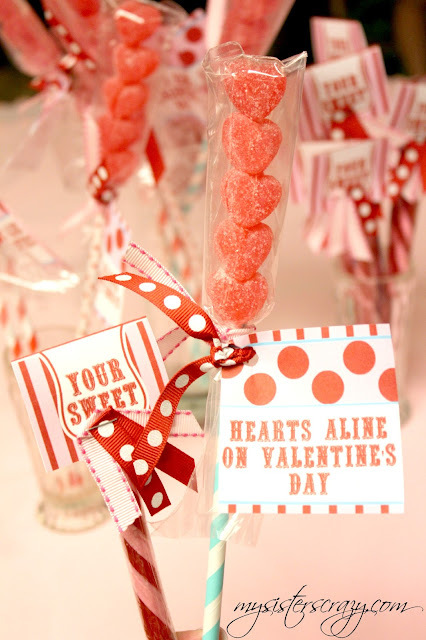 As a child I remember receiving Red Hots and Conversation Hearts. They had been stuffed into tiny white envelopes by grade school friends. This was the beginning of my my love for all things cinnamon. The love only deepened as my Mom would help us make a giant heart shaped sugar cookie for my Dad. 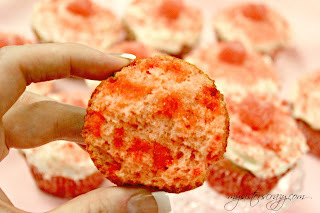 We would frost the cookie with pink frosting and decorate the top with Red Hots. 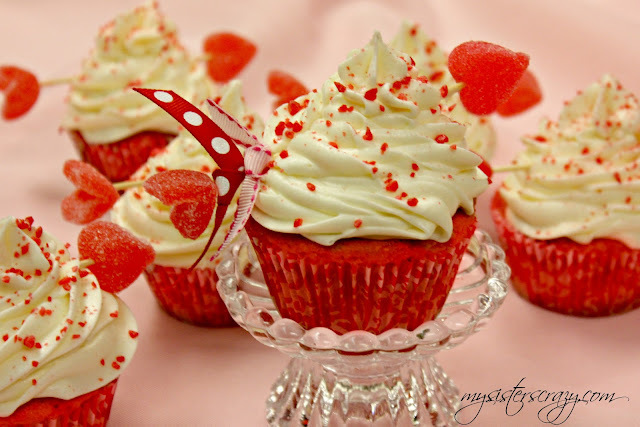 For some reason that sweet smooth frosting with bites of hot cinnamon candy was a pure Valentine delight!! I wait all year just to recreate the sweet and spicy taste of frosting and cinnamon candy. This year I am recreating that flavor in a cupcake. I crushed Red Hot candy in my blender and added it to my cake mix. The tiny Red Hot pieces melt into the batter when it is cooking. This leaves the cake moist, sweet and with a spicy kick of cinnamon. I decorate them two different ways. Some of my family are the frosting type…for them I pile it high! Really high! For those more interested in cake, I leave the frosting at “normal” levels and load the top with Red Hot dust…OH I love the bite of that Red Hot dust! I especially like these cupcakes with accents of a cinnamon jelly candies. 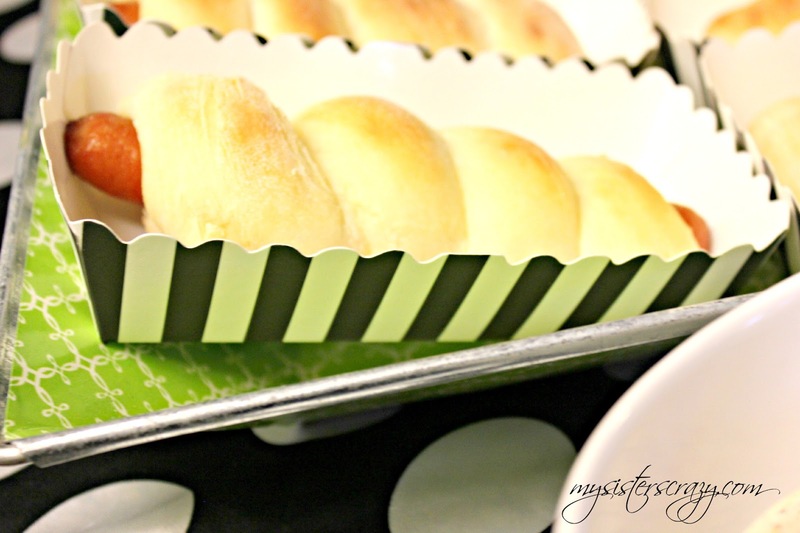 CLICK HERE TO GET THIS RECIPE AND PRINTABLE!! They are adorable just mushed into the frosting or they make KILLER Cupid arrows. EASY, DARLING, KINDA MY FAVORITE!!!!!! Sugared cinnamon candy might just be the most perfect candy ever created on the face of the earth...in my heart it even beats out chocolate. Sorry! 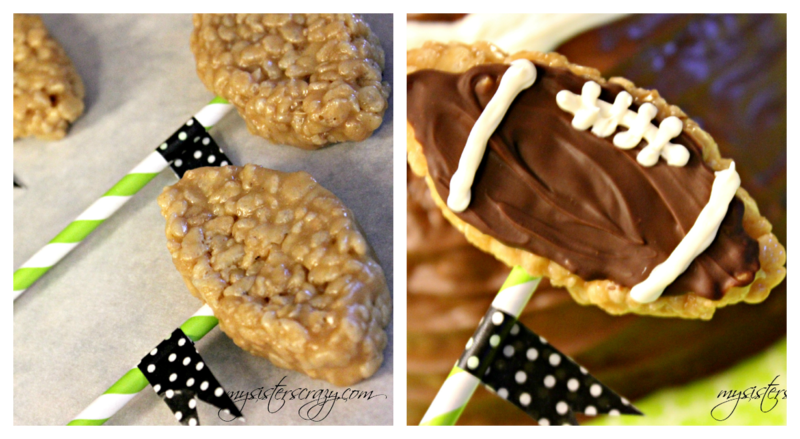 Not only are they delicious but they are versatile. 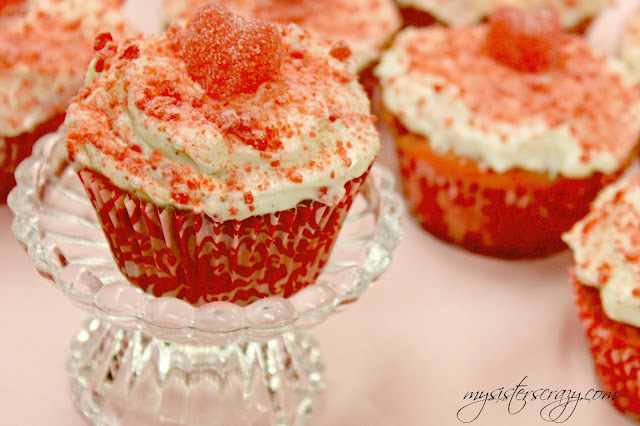 They are a great cupcake and sugar cookie accent. They make an adorable Cupid's arrow. Have I mentioned...they also make a great candy KABOB!?!?! YUP, they do! 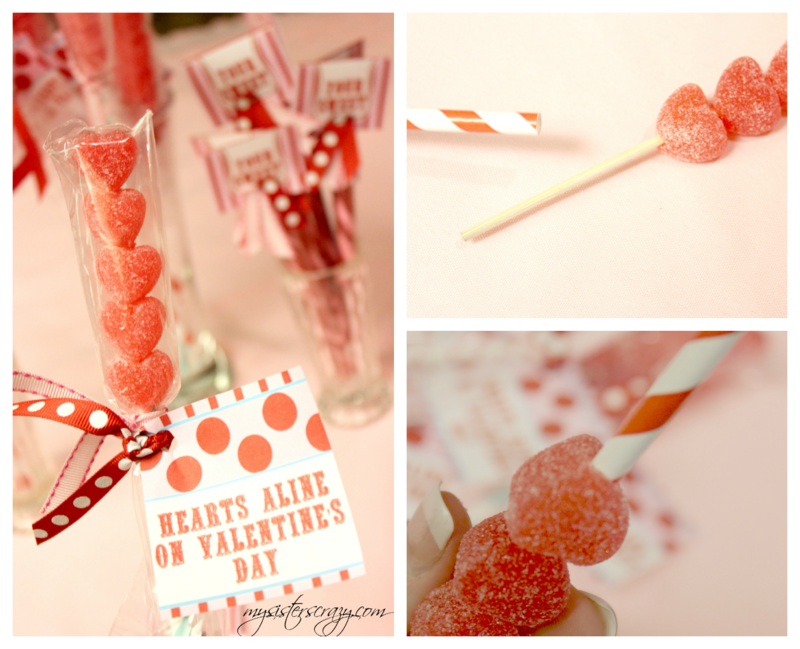 The heart Kabobs make an adorable center piece, a take-a-way token, or a great Valentine! 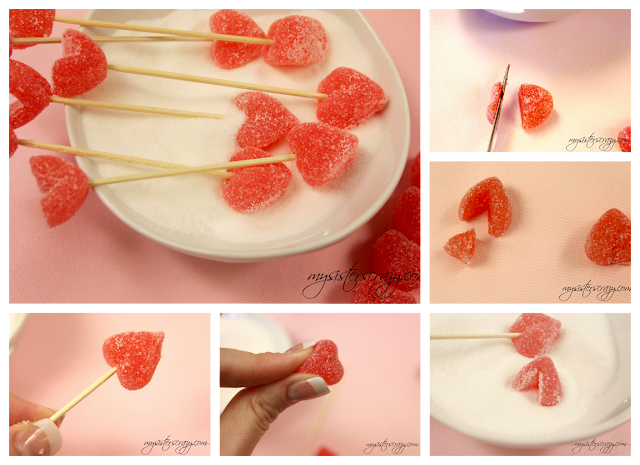 Once the candy is all skewered, put the remaining pick part into a paper straw and push the straw up into the bottom of the last heart. 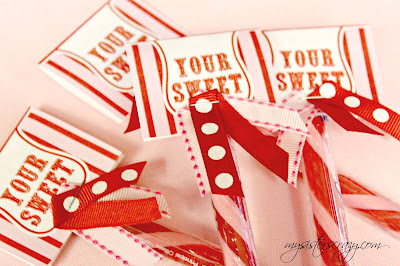 Then wrap them, bow them, and put a tag that reads; "Hearts aline on Valentine's Day"
I also use old fashion candy sticks. They are all over the Internet and simple to order. However, I found these at Walgreen's! Seriously! They are 3 for a buck. I remember them being way cheaper than that when I was a kid...but, that was a long time ago. They look so fantastic! 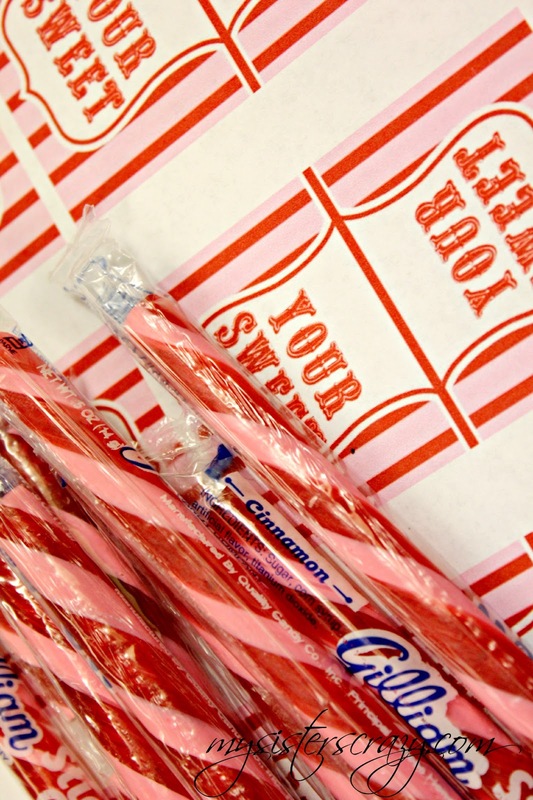 The plain candy sticks are cute all by themselves but, I do like to dress them up a little bit. It is a great way to use any leftover scraps of ribbon. 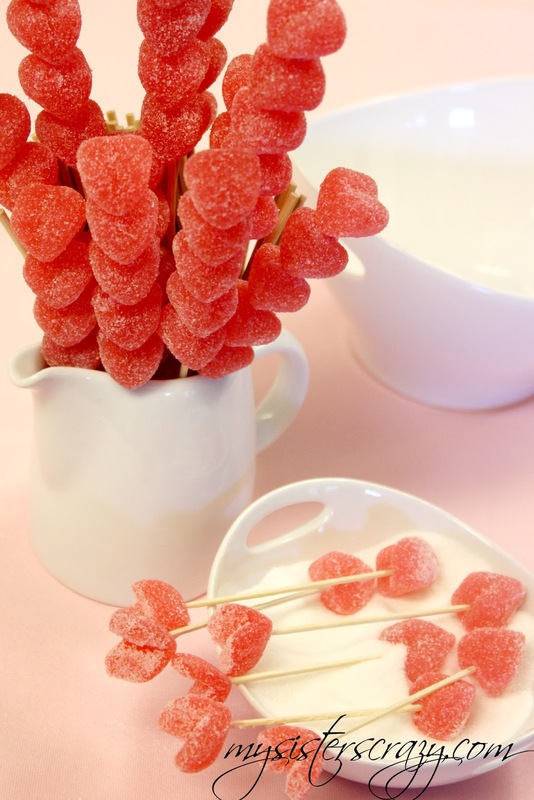 I like when candy can also be used as a decoration. It is like getting the ultimate 2 for 1 deal. Anytime I can use 1 thing for 2 purposes I get excited. That means less work for me. 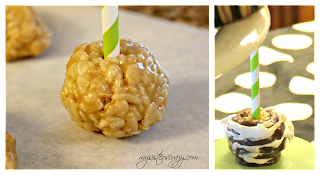 Both of these treats will look great at my party and also be fun to give out to my guests. Well, while we have explored a couple of "candy stick" options...we haven't directly discussed the "SUCKER". I think this Valentine treat is hilarious! I mean seriously I realize the cheesy irony behind Valentine associated candies but...honestly, who has not been here!?! I for one have been a "sucker in love". The Slang Dictionary For The English Language defines "Sucker" as gullible or easily tricked. It also means; one who would do anything. 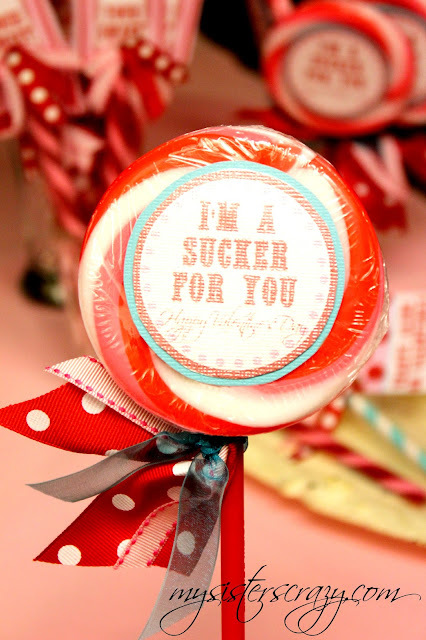 "Sucka" is also listed as an accepted substitute for the original slang word "Sucker". Ever felt like a sucker before? Maybe this should be the gift you are giving this year! 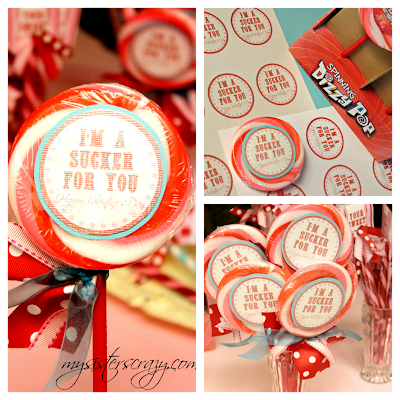 I am certainly a sucka for the one I love! 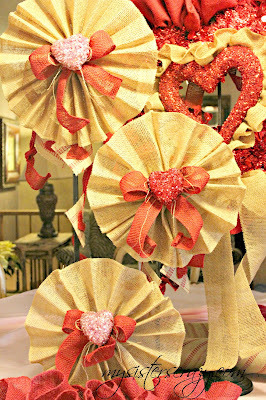 After making my Valentine’s Day wreath and table runner I had lots of burlap paraphernalia lying around the house. 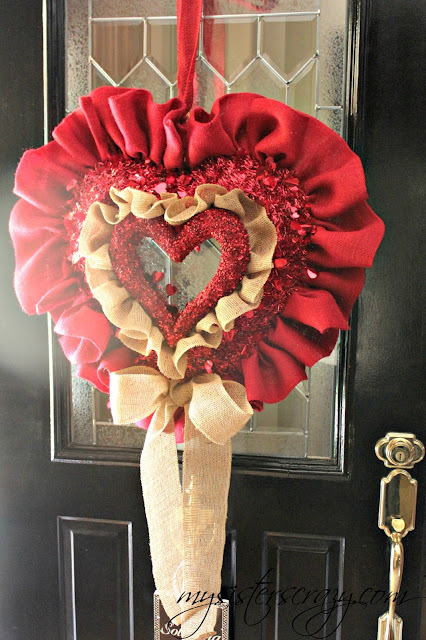 I will be having a Valentine's Day party and these new additions will make it a real "hearty party" I can’t throw stuff away…I keep every scrap thinking I could one day make something out of it. 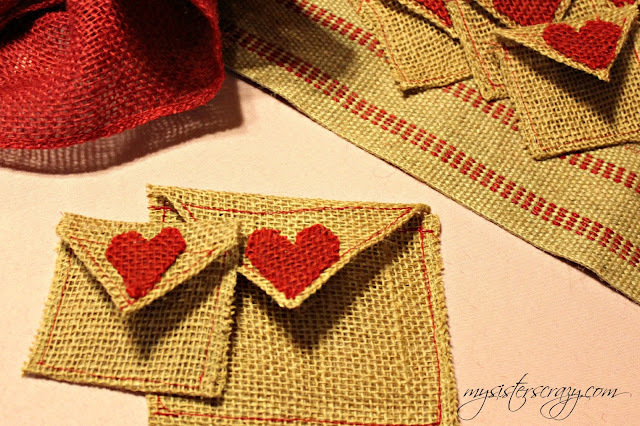 I rounded up the left over burlap and made a few additional Valentine crafts. Super easy and a fantastic use of left over scraps. 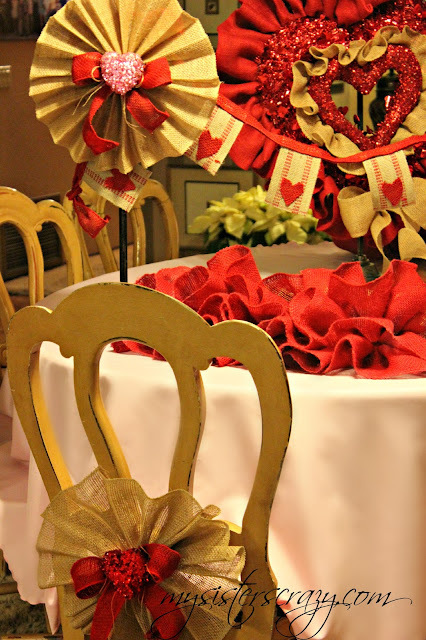 I used about 1 yard of the giant burlap ribbon to make fans for the back of my chairs. If you think making them out of paper is easy, you should try using this stuff. It folds and creases well and is stiff enough to keep it's shape. I admit I like these so much they will not only be on the chairs but, several other places as well. 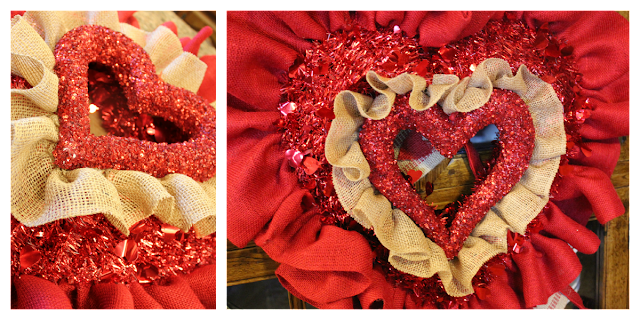 They hang well on wreath hangers, so there are all sorts of possibilities. 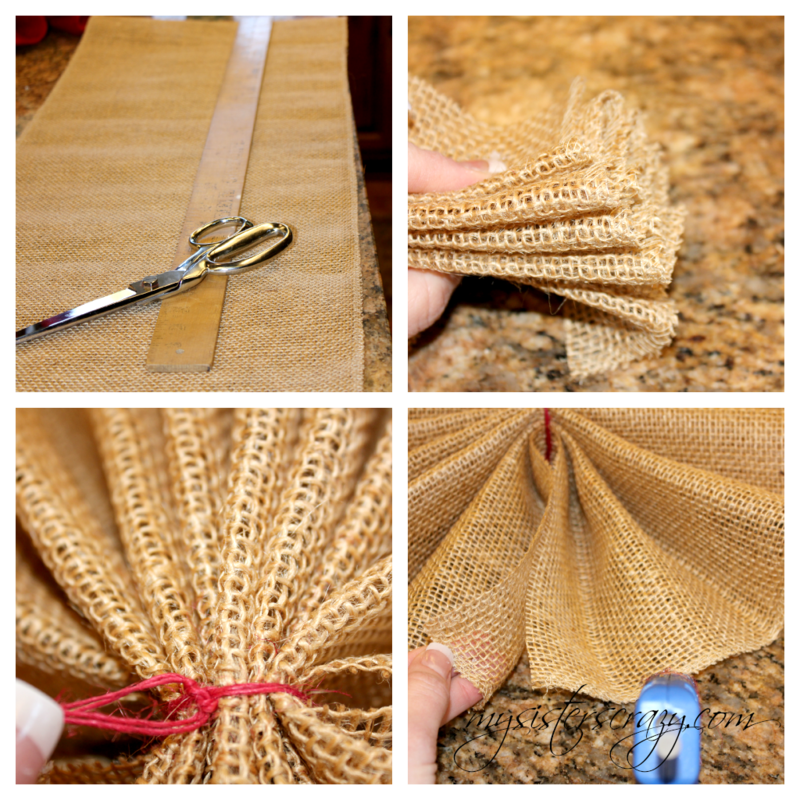 However, there was still lots of left over scraps of burlap fabric...what to do? Well...Love envelopes, silly! I am not sure what type of treat will go in these yet, but my mind is spinning with all sorts of options. They were simply to make and only took about two minutes to cut, iron, and sew one together. That is including the sewing the red burlap heart on the front. I will be the first to admit that these envelopes are a bit on the rustic side. I don't mind their homemade appeal. I made them two different sizes. 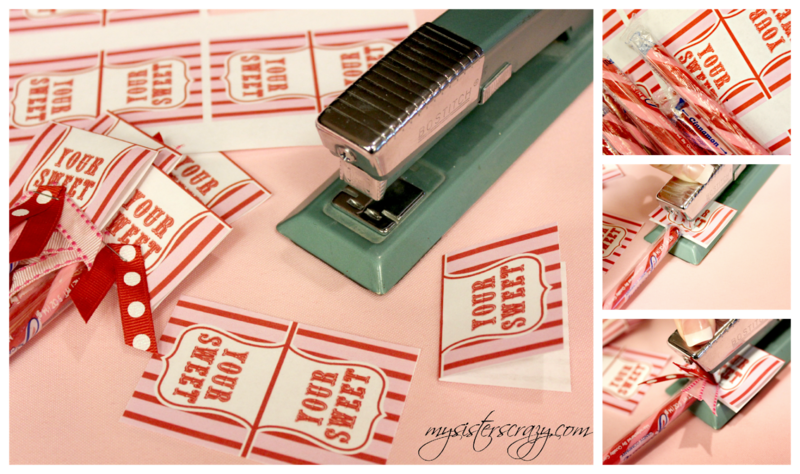 The bigger one is a great size for a treat and the tiny one is perfect sized for a love note of some sort. Now, who do I give them to? I really enjoyed making the new wreath, the new table runner is sublime but, somehow the scrap crafts wind up being my favorite! I guess it is true what they say... One man's trash is another crazy person's treasure. (That is what it is...isn't it!?!) Love my new treasures. 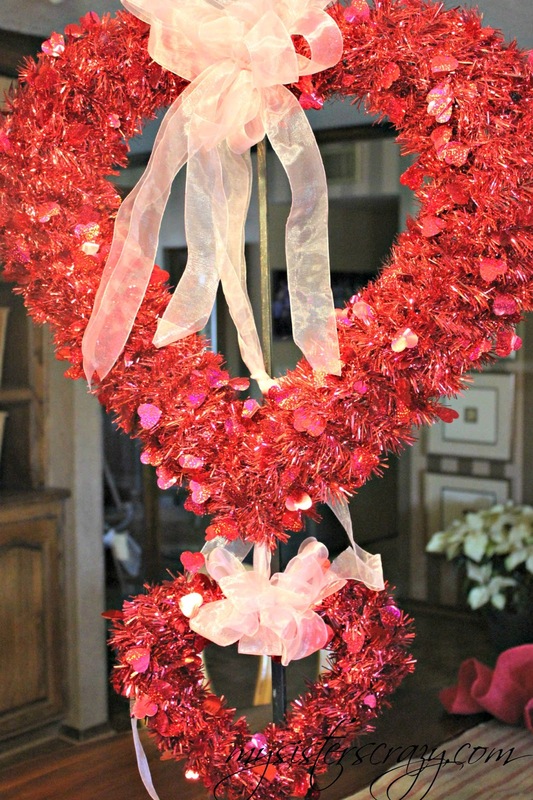 This year for Valentine’s Day I “revamped” my old standby heart wreath. I have had it on the door for the last couple of years. I love it, don’t get me wrong…I just get bored! It was time for a little lovin’ to an old favorite. 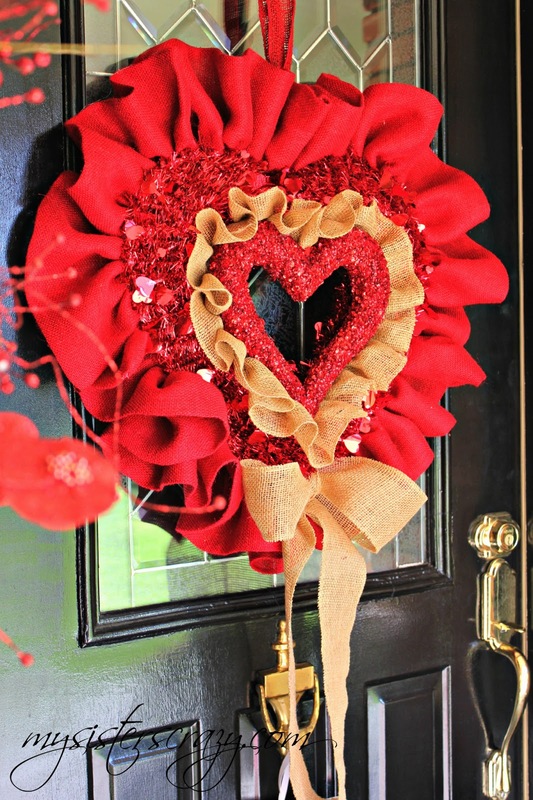 It was quite easy and I already had the shiny heart wreath…so it was really inexpensive. 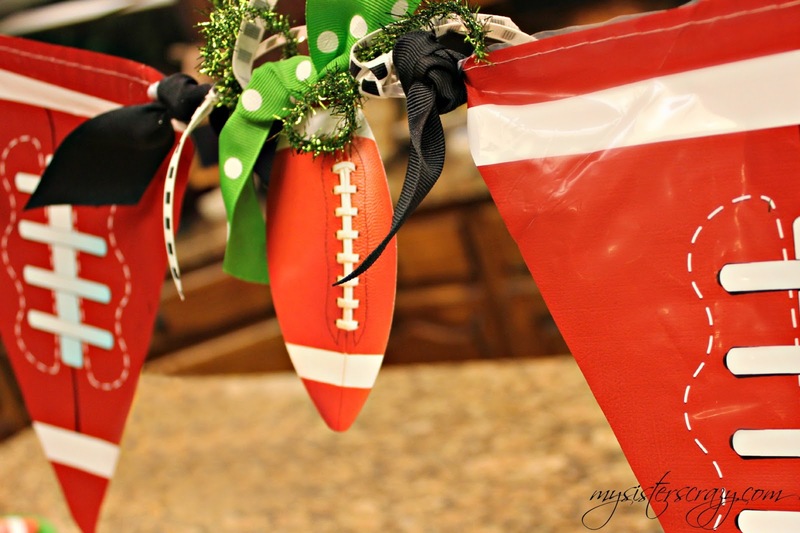 Even if you don’t have the wreath, they are under 20 bucks…most craft stores accept coupons so you can get them as cheap as $10.00. All I had to do was buy burlap ribbon. I wanted pink burlap ribbon. That however, is not as readily available as the red. I could have ordered it BUT, I was impatient today…I wanted it done NOW!!! All I did was gather the burlap by pulling one of the threads of twine. It gathers it beautifully! Just be a little gentle, sometimes it can break if you pull too hard! DANG! Once the ribbon was gathered I used the easy hot glue method and glued that ruffle right on the back of the wreath. To be honest, I really liked the wreath at this point. It is darling. However...I can't leave well enough alone...I usually go overboard! I then ruffled natural burlap ribbon and glued that to the back of a smaller hanging heart decoration. It was cute darling as well. I will be making several more of these little guys to hang around the house. 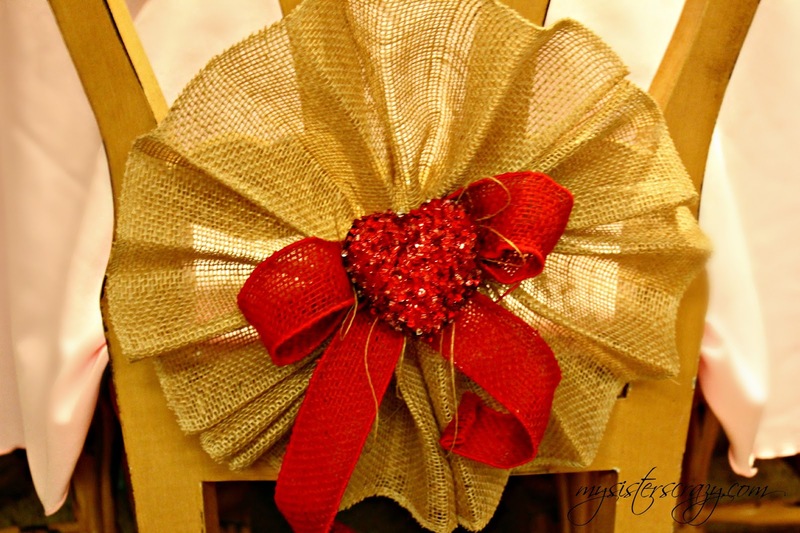 I then layered those two together with my glue gun and added a burlap bow. I like the added length the tails of the bow make. I think the length looks good on the door. EASY, PEASY! I like the new look. It looks great with my new runner…I might have to make another one for the inside the house! It was a very satisfying morning project. 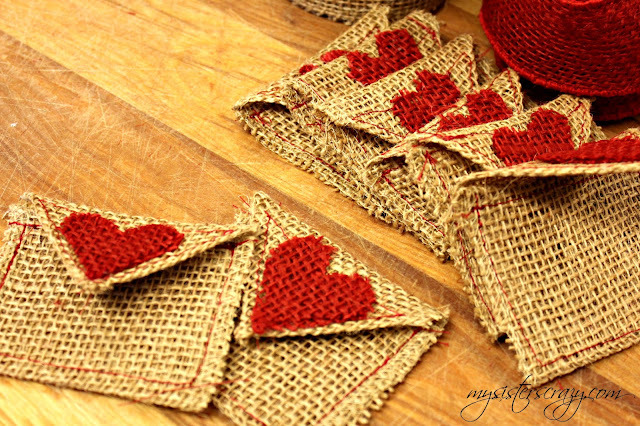 I have plenty of burlap left...I wonder what else I can make.....????? ?